I am back now after a dead project and some shenanigans here is my new project. Description: A map pack made by yours truly Drwalrustein. Edit: The reason why I changed it to Zandronum since GZDooM when I tested it was not really compatible with it. If you want, I can change the map to E1M1. I'm gonna update with feedback on the mod. EDIT: Wait, what IWAD does this use? CHEX3.wad also I want the starting to be DooM 2 style were you don't choose episodes but maps in the main menu can anyone help? Also, I found some little flaws in your mod. I'm pointing these out to help make it better, this is actually pretty good, and you get some passes since it's your first map. I checked, and this isn't any kind of secret wall, it's just a grass wall. That's a little off. The level was pretty short. You went into a room, another room, and got the key. Repeat twice, and the level's done. I mean, it's well done, but you should make it longer. Normally what people would expect from an alpha is a level that's a little bit longer. There was a maximus on the first level. Now, it's possible to lure him out of the room and then sneak over to the lock to win the level, but it's kinda tricky to do. Only three major bad things about the map, and it's your first map, overall it was good for a starter. I did a patch also when I put secret on linedefs it doesn't say secret when I walk over it or show it on the map. Also a free secret: In the first room look behind you and you see a slimey wall walk into it and you find the zorch prepulsor. Not bad! I wouldn't say it was too easy or too hard, and for the first map in the WAD it didn't HAVE to be bigger IMO. But I think you had a couple texturing issues; in the zorch propulsor secret the slime textures don't tile properly since the walls are too narrow. In the room where you get the red key, the texturing looks a little awkward to me... Especially on the ceiling. I guess you need better detailing in general on the level. Good work so far though! Oh, also Zandronum said it couldn't find the music "BJORN_L" for the level. The BJorn_L was a midi file that never worked. I will release a new version with a working midi file. Required IWAD: It is an IWAD! 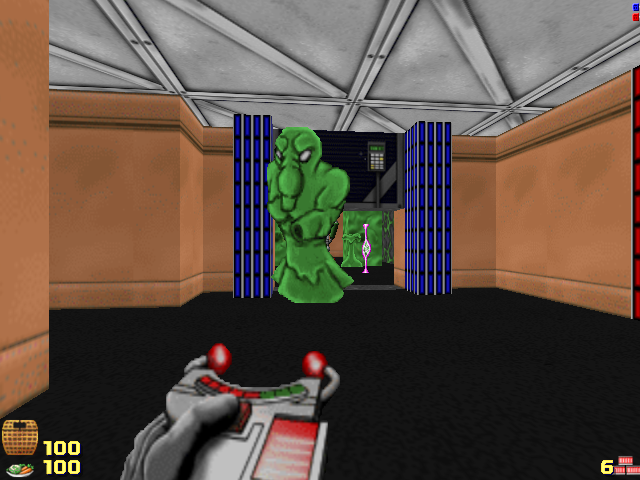 Description: Remake of Chex Quest, attempts to replace everything with hi-quality textures. Runs on GZDooM. Do you have any high res textures in this yet? I looked through it real quick and it looks like all stock textures from chex.wad? He does not, but I'm making the high-res versions and making them right now. It's up to Arch I suppose, but I'd recommend waiting until you have more done before asking for a project forum. Also, this really shouldn't be an IWAD, what if somebody wanted to load it as a HD textures pwad? Why bloat the file size by copying every single (unmodified) sprite? attempts to replace everything with hi-quality textures. He means for the alpha release. And I agree, if you have an alpha with ONLY the status bar changed, it's gonna be too bloated. IIRC there used to be a rule that said that you need to have a significant amount of progress toward your project before you would be able to get a project board, but I can't find the topic anymore, maybe they got rid of that rule?